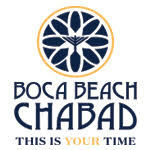 Welcome to Boca Beach Chabad East Hebrew School, an exciting and innovative educational program in East Boca for children in Kindergarten through Grade 7. Here every Jewish child feels welcome, regardless of knowledge or affiliation. Chabad Hebrew School is where Judaism comes alive and children are encouraged to ask and explore. Our staff, hands-on curriculum, and holiday workshops are sure to make this upcoming year both educational and enjoyable for our students. For more information, please call the Hebrew School office at 561-394-9770 .